SMART - Your Auto Lifts allow you to make thousands of dollars every week. A lift out of service results in lost revenue. You need your techs making money not excuses. Minor repairs and needed adjustments will minimize downtime and major breakdowns. 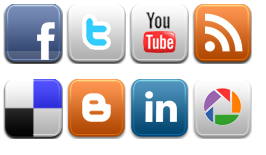 PROFESSIONAL - As an Owner/Manager you set the standards for your business. Like a car, Preventive Maintenance increases performance, longjevity and safety of operation. 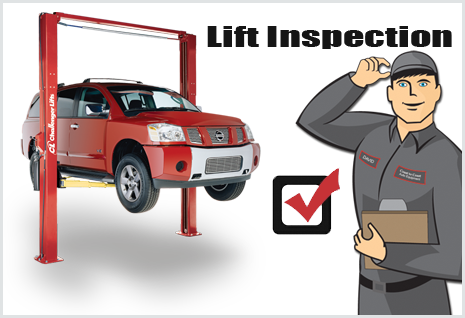 The Automotive Lift Institute (ALI), the leading OSHA recognized lift certification organization in existence globally, recommends that car lifts undergo annual inspections administered by qualified lift inspectors specifically trained on procedures outlined by the ALOIM-2008 National Standard Covering Safety Requirements for Lift Operation, Inspection and Maintenance. 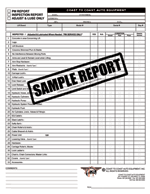 In order to be valid, all such inspections, repairs, service and routine maintenance must be documented, detailed, placed on file and kept up-to-date. Proof of proper training must also be presented for each employee. 5.1 Qualified Inspection Procedure. The owner or employer shall establish a periodic inspection procedure in accordance with the recommendations of the lift manufacturer in order to ensure reliability and allow the continued safe operation of the lift. Please be reminded that certain sections of U.S. Code of Federal Regulations, Title 29, Section 1910 and applicable subparts-Occupational Safety and Health Administration, General Industry Standards may pertain to the procedures anticipated by this section. Compliance with applicable regulations is left to the person(s) involved.